But the good news is even if you have to rush your morning routine, you can still enjoy those waffles since they are easy to keep in the freezer, ready to be enjoyed. I just triple the recipe, freeze them in a large bag and unfreeze them a day ahead in the fridge... or just pop them in the toaster for a crunchy waffle! As for the toppings, we usually do sheep or coconut yogurt and fresh seasonal fruits but we also love to serve them with other garnishes ; fruit compote, homemade healthy hazelnut chocolate spread, strawberry chia jam or even this incredible blood orange maple syrup. Combine all the wet ingredients in a small mixing bowl. Set aside. In a large mixing bowl, add the dry ingredients and whisk until well combined. Add wet ingredients to dry and mix until well combined. Let your waffle iron preheats (adjust your waffle iron according to your favorite settings and instructions. 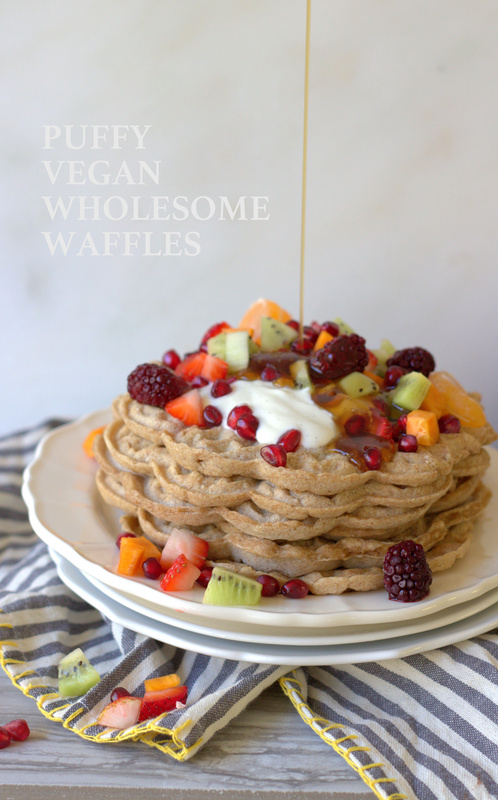 Note : I have this heart waffle iron (love it!) and usually like to select the "crisp exterior moist interior" setting with a 4 out of 5 on the color control setting. Once waffle iron is ready, coat with non-stick spray and pour on about 1/2 cup of batter (depending on your waffle iron). Cook according to your waffle iron's instruction. I like to keep my waffles in the oven at 200F while I do the others until ready to serve. Serve with desired toppings, such as yogurt or coconut whip, fresh fruits and maple syrup. You can freeze the waffles in a freezer bag and reheat in a toaster or oven.